Do you think that this steak pie looks really appetizing? Can you see the tender pieces of juicy steak in a rich gravy as advertised on the packaging? Nope, I didn't think it was that appetizing either and I certainly didn't find many chunks of juicy steak in there. It has to be said though, there was plenty gravy. In fact I think the filling was MOSTLY gravy with a few gristly bits of meat and fat and goodness knows what else! This particular steak pie wasnt meant to be a deep fill one, but I had hoped for a bit more filling than I ended up with. I reckon I could easily have nailed this thing to the outside wall and picked up some television channels it was so flat and devoid of any substance. I was so looking forward to my dinner, a lovely meaty steak pie and mashed potato - this is my all time favourite by the way and I can tell you that I was sorely disappointed on this particular occasion. It really annoys me when I buy a product and once I open up the box its nothing like the product I saw in the photo. Isn't that false advertising and is there not some law against that? I've noticed that this seems to happen more often with food bought from the big supermarkets. Stuff from the freezer, ready meals, pies, pastries and deserts etc. all come in these fancy colourful boxes. Its all very well to advertise using pictures of delicious mouth-watering food, but youve got to follow that up with actually having a product in the box that resembles those images. I guess if you want a really good meat filled steak pie, the best bet is probably to dig out a recipe, your rolling pin and go make one yourself! Alternatively, there are still a few specialist pie and pastry shops that make their own on the premises. Ive had some really nice steak pies from the butcher shop where I grew up, but there again Im naturally biased towards Scottish steak pies they're the best in my opinion! Perhaps thats why my expectations are so high. Totally agree. The pie on the box never looks anything like the pie in the box. Always a rip-off. This is so true, whether it's a steak pie or a fruit pie, the picture on the box is always misleading without exception, apparently oozing with chunky goodness. It's amazing that in the 21st century suppliers can still legally get away with this. I wonder if this practice could be challenged in the courts. To boblet42, with regards to your comments on pukka pies, I think you may have gad another brand. Pukka pies are the number 1 brand for a reason and they only use the very best products. I agree with AJP make your own, so easy, tastes better and definately healthier! I hadn't made up my mind what to do for dinner, decided after reading your posting to make a pie ...... it's in the oven. It took me about 20 minutes to assemble and prepare the ingredients and roll out the pastry, put it all into a pie dish and it's now in the oven. "All this type of food is crap. Make your own - cheaper and healthier. And you always know what you are getting. ajp - 31-Oct-10 01:52 "
Amazingly this essentially reasonable post gets a negative vote of 104!! Why? Whilst the first sentence could be debated, the second and third ones are definitely true. PS - Grumpy, that sounds delicious - quite hungry after reading that!! "Why, oh why do people buy this overpriced, overpackaged garbage?" Because they are lazy, have no imagination, don't know how to cook, can't organise themselves to have the hour or so it takes, they'd rather shove some muck into the microwave and have a 'meal' ready in 5 minutes. Also because they succumb to clever marketing and advertising. How long does it take to buy some ready made shortcrust or puff pastry rolled out; take a pie tin out of the cupboard (or buy one); tip in some nice home made filling - brown seared beef or other meat first covered in plain flour, add some onions and other veggies to stoften and then return the meat to the pan and add some stock; place in pie dish and then roll the pastry over the top, crimp the edges, shove it in the oven for 30 mins until brown. When you slice it out will come lovely thick juicy chunks of meat in a rich gravy mixed with your nicely softened cooked veggies. Why, oh why do people buy this overpriced, overpackaged garbage? The only pies I ever buy are pork pies because it's next to impossible to replicate a Melton Mowbray from home. All food like this has been "dumbed down" to the lowest common denominator: a complete vacuum of quality. Yuk. All this in the name of profit and commercialism. Even if you try to make one yourself, nowadays the cows themselves have been fed on "dumbed down" crud food. Yuk. 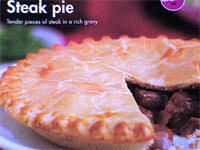 All processed food like this steak pie is mass produced in huge factories. Do not believe the 'home-made' hype that some adverts depict. I have seen the factories where processed food is made. Huge vats of slush and dough and tons of bags of 'flavourings', enhancers and edible powders are added to make it "tasty" because there is nothing much in the main ingredients. Following, this, storage of the items and finally sitting on the supermarket shelf - makes this a very "old" pie. If we continue to feed our kids crap - don't blame them when they grow up and want the same crap. All this type of food is crap. Make your own - cheaper and healthier. And you always know what you are getting. Pukka Pie they have pinched the word Pukka meaning proper & good. The pie was crap. what I do is buy products that are just going out of date. so as with the pie I had not paid much for it. I can assure you that Pukka pies will not get any more of my money. I have told every one how crap it was, other than the box of course,that was good quality which leads me to believe that pukka pies management are smart @rse idiots. I hope the person on the filling machine relises that the WW2 defence of I was only obeying orders does not exhonerate him/her from this deception. The company is currently being restructured, but the 'Denby Dale Pie Company' made the most fantastic steak and potato pies. It was price pressure from supermarkets unwilling to pay for good quality which ruined the company and I am more convinced than ever that most of the major supermarkets could not care less about the genuine quality of their products, preferring pretty boxes with product just barely able to meet the minimum of standards. 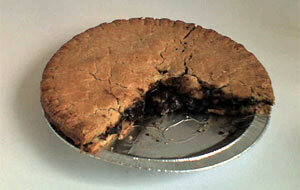 Sweeney Todd's make good tasty homemade pies but one has to mind the fingernails. Get a free shave and haircut next door.